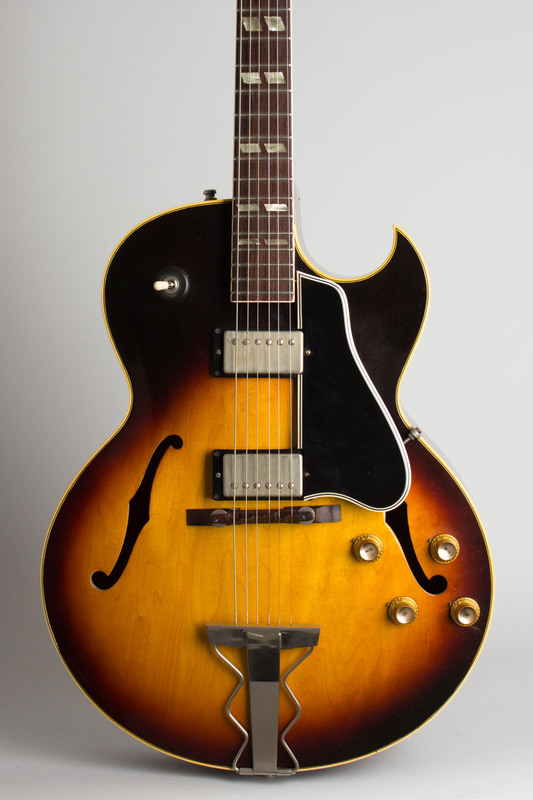 Gibson ES-175D Model Arch Top Hollow Body Electric Guitar (1963), made in Kalamazoo, Michigan, serial # 97693, sunburst lacquer finish, laminated maple body, mahogany neck with rosewood fingerboard, hard shell case. 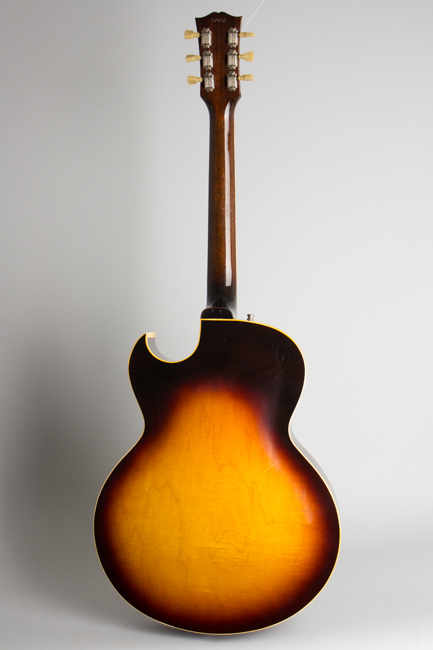 This is a superbly clean and apparently little-played example of a 1963 ES-175D, Gibson's perennial "working man's" electric archtop. This lovely guitar is now a fine "player's" piece --it remains in wonderful cosmetic condition but has suffered the prime indignity this model often endures, as the original pickups and wiring rig have been removed and replaced with modern correct-style reproductions. 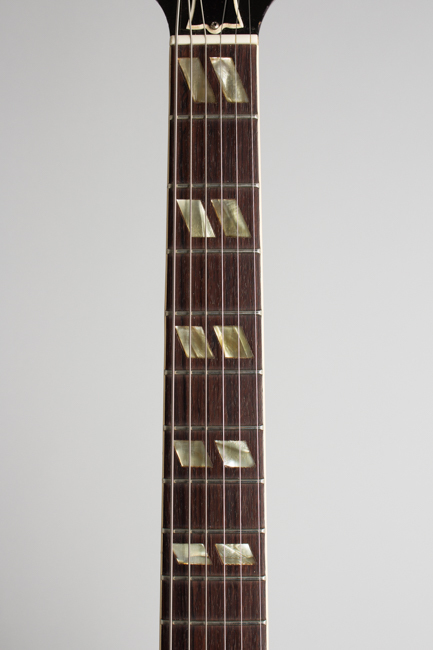 This guitar originally had either late PAF humbucking pickups or very early Patent No. units, which are sonically identical. That 1962-3 rig is probably now residing in somebody's Les Paul, while this guitar carries a set of what appear to be Gibson "Classic '59" re-issues. These are in themselves fine sounding and very appropriate pickups for this hollowbody model, authentic to the period without the overwound high-output "rock" sound of most modern humbuckers. As it stands, this is now a great gigging ES-175. Offering one of Gibson's best combinations of features and value, the 16" wide fully hollowbody model has been popular since its launch in 1949 and is widely considered one of the classic electrics of all time. 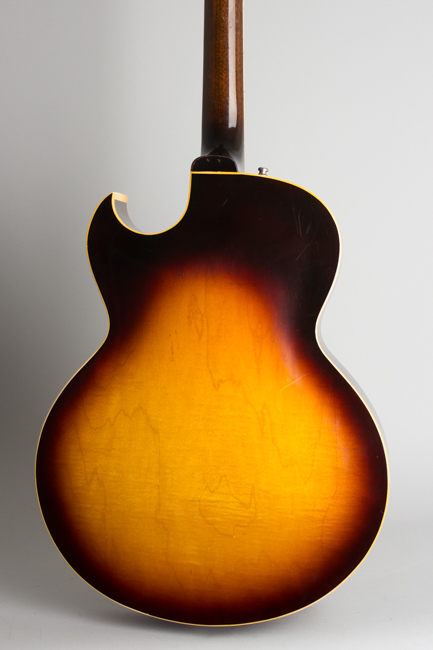 This dark sunburst two-pickup beauty is from early 1963, right at the end of Gibson's flat-profile neck period. 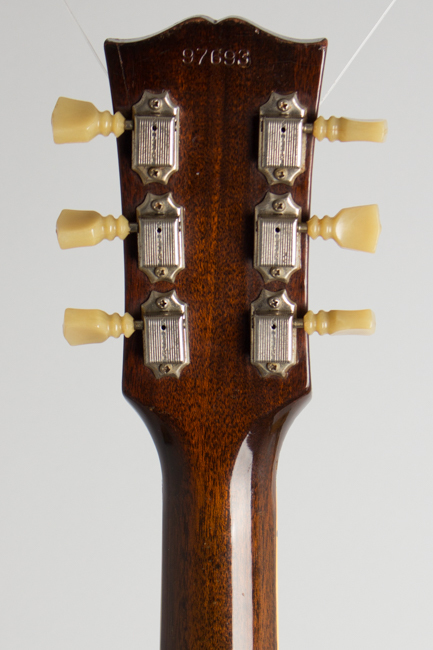 These necks have the traditional 1 11/16" nut width but are much shallower back-to-front compared to late 1950s examples. This would likely be one of the last built to this spec. before Gibson reverted to a deeper, chunkier profile in mid-'63. 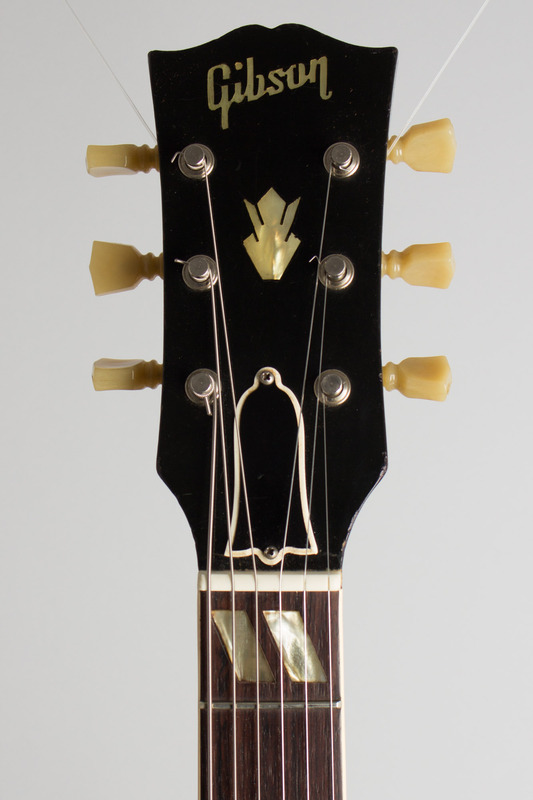 The other features are typical for the period: the two humbucking pickups; a 4-knob, 1 switch rig with early '60s-style metal-capped amber knobs; Kluson Deluxe tuners with keystone buttons; the unique "wavy" nickel-plated tailpiece...all the classic 175 elements. 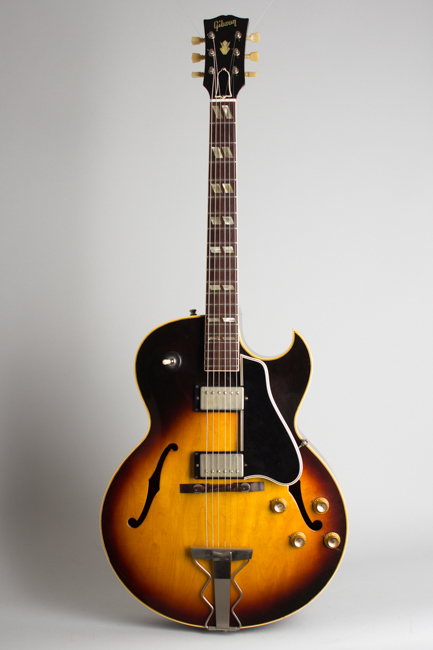 While to many players the ES-175 instantly murmurs "jazz", it is actually a versatile guitar suitable for a wide range of styles. Ask Steve Howe! 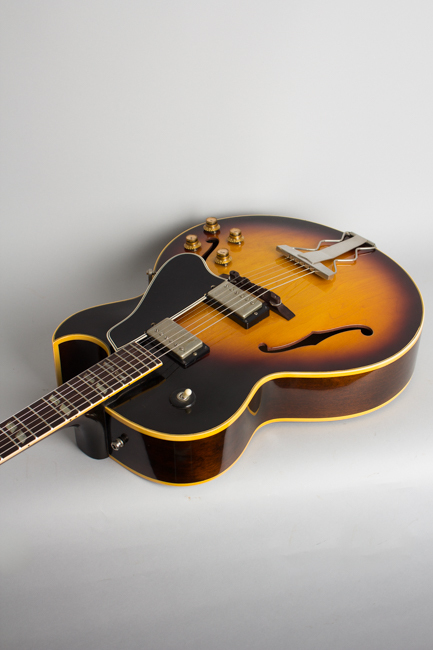 Still, this model is mostly associated with a litany of jazz greats including Herb Ellis, Jim Hall, Pat Metheny, Kenney Burrell, and many more. While this example is no longer totally original, it still looks perfect correct and performs extremely well, exactly as the wizards of Kalamazoo intended. Overall length is 40 7/8 in. (103.8 cm. ), 16 1/16 in. (40.8 cm.) wide at lower bout, and 3 3/8 in. (8.6 cm.) in depth, measured at side of rim. Scale length is 24 3/4 in. (629 mm.). Width of nut is 1 5/8 in. (41 mm.). This is a VERY clean guitar, showing hardly any play wear at all but with the alterations noted. There is a tiny repair by the jack, as is often seen, but no other repairs. The pickups, pots, and entire wiring rig are of fairly recent vintage, but all are high quality and stylistically correct parts. Additionally, it has been refretted (a very good and also stylistically correct job) with a new bone nut. The adjustable rosewood bridge is also of recent vintage and the metal strap buttons are newer as well, with one added to the upper bout. All other hardware is original including the tailpiece, tuners, pickguard and bracket, knobs, truss rod cover, and switch tip. This is an excellent player's example of a fine 175, priced quite a bit lower than if the original pickups were intact, and makes for an excellent choice in a performing guitar. Overall Excellent Condition.